Photos © Brian Ecott unless otherwise stated. 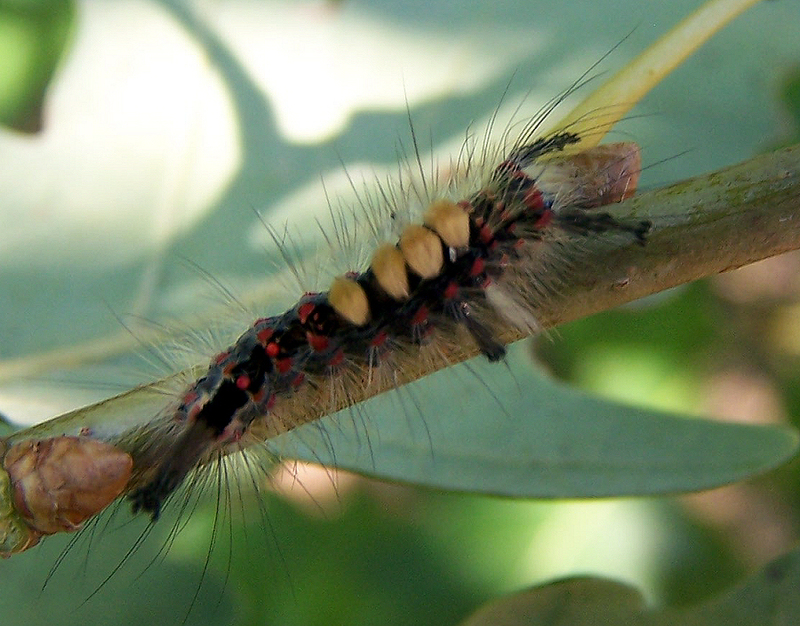 Moth and Butterfly larvae or caterpillars have three pairs of true legs and four pairs of prolegs, one of each pair can be clearly seen in the picture below. 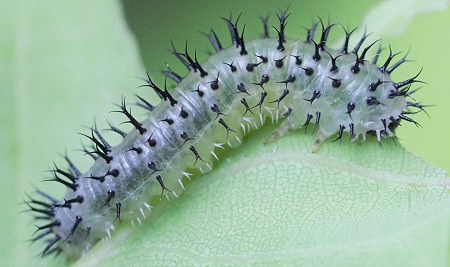 All other caterpillars have variable numbers of prolegs, such as five pairs or more in the Sawfly larvae. 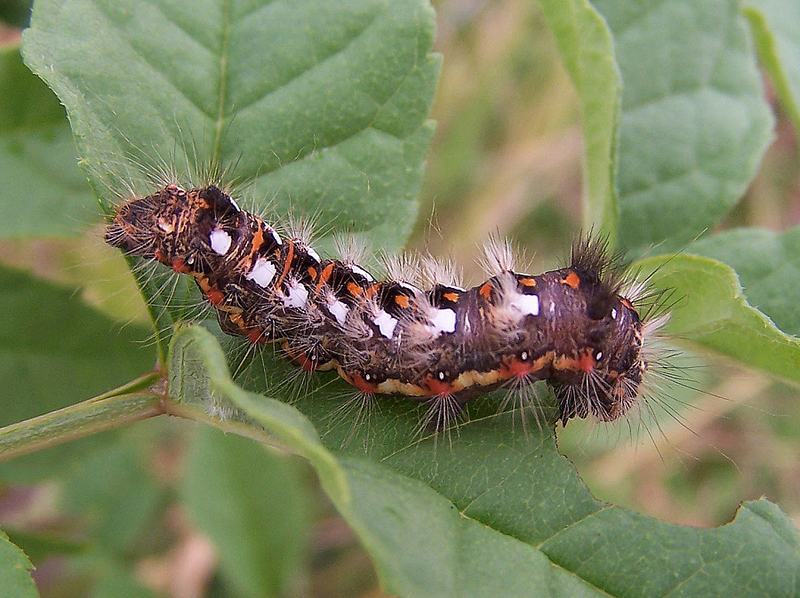 Caterpillar of the Cinnabar moth. 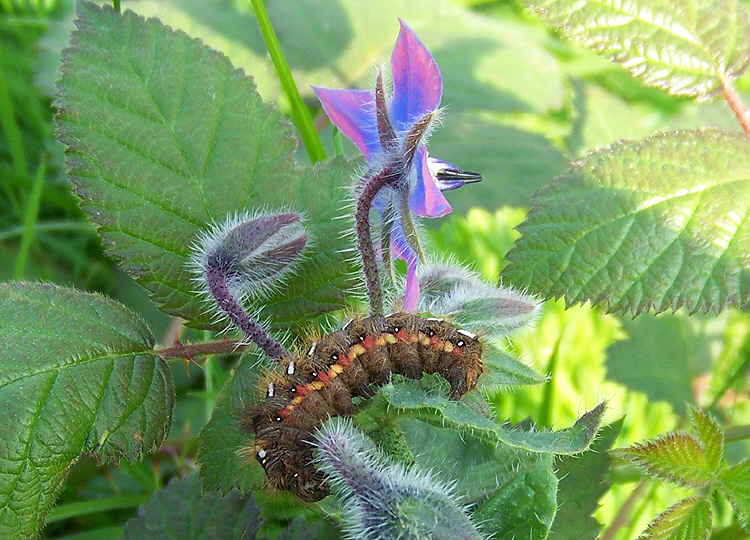 It is a very avid eater of Ragwort and will eat a plant to the ground before climbing another. 17th July 2014. © Michael Rumble. 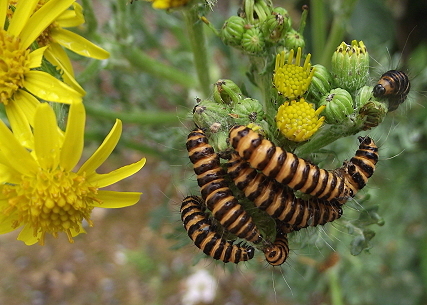 Hungry striped orange and black caterpillars of the Cinnabar moth Tyria jacobaeae feeding on ragwort. They will eat a plant down to the ground and move on to the next. 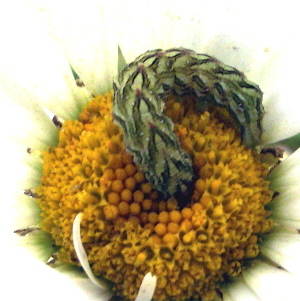 Their bodies contain poison accrued from the Ragwort plant and many predators avoid them. 21st July 2015. 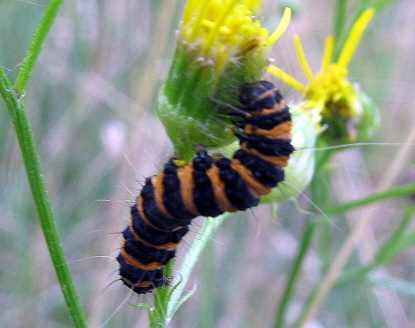 The Cinnabar moth caterpillar Tyria jacobaeae feeding on its foodplant Ragwort in the meadow. 4th August 2016. 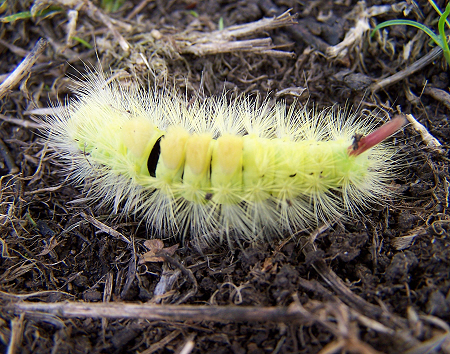 Found between July - early September when it pupates in the soil and emerges as a moth May to July. The Buff-tip Phalera bucephala. 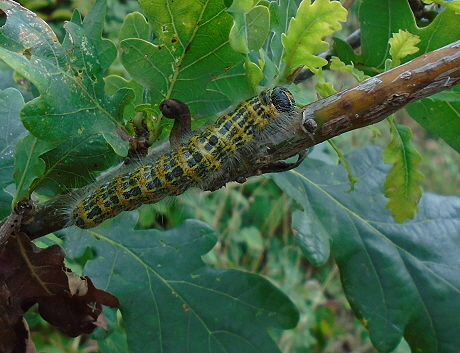 Caterpillar feeding on Oak leaves near the lake. 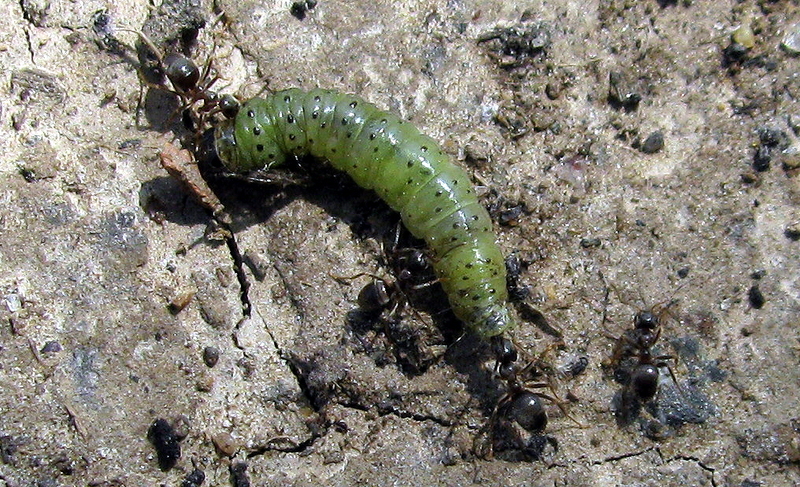 Feed from July to September, when they pupate in the soil. 35mm. Buff-tip moth caterpillar 22nd September 2016 Photo © Raymond Small. 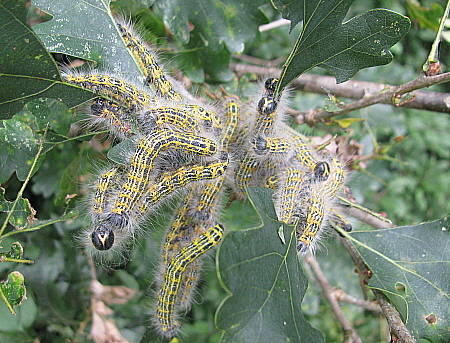 Buff-tip moth caterpillars stripping oak leaves. Photo: 21st July 2006. 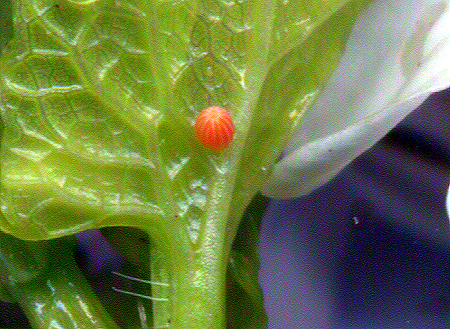 Attached to a leaf stalk of Garlic mustard is a tiny orange egg 1.2mm tall. 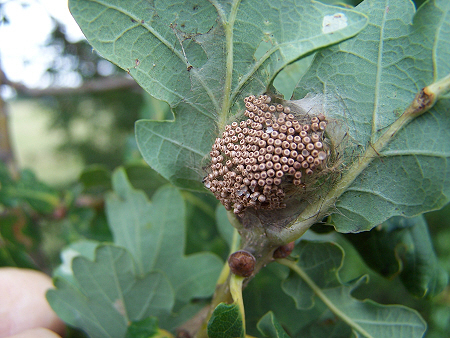 Scanned at a high magnification shows vertical red ridges around the egg which will soon hatch and feed on the leaves and stems. Scan 24th April 2014 Four days after the egg left was scanned the young caterpillar 5mm. 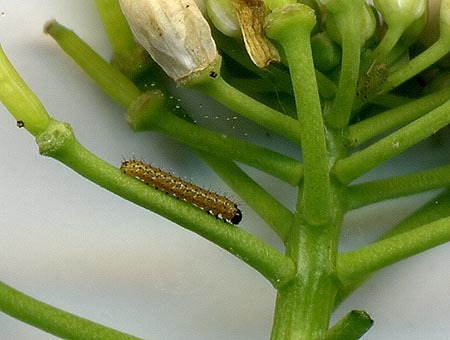 of the Orange tip butterfly was found in the flower head. Scan 28th April 2014. Caterpillar of the Lackey moth Malacosoma neustria 29th May 2016. Photo © Brian Ecott. 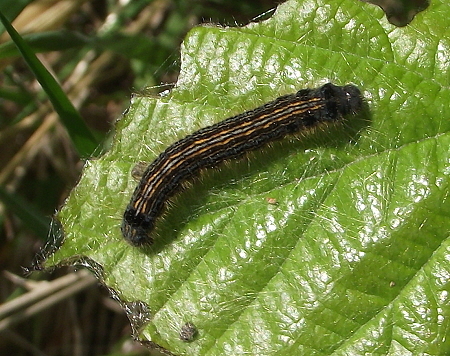 Normally found on hawthorn or blackthorn. May have fallen onto the bramble leaf from from the hedge. Common white wave caterpillar Cabera pusaria on Hazel leaf 13 Sept 2012. Broad-bordered Yellow Underwing moth caterpillar Noctua fimbriata, found in the wildlife garden 11th May 2009. Dot moth caterpillar Melanchra persicariae ox-eye 19th June 2016. 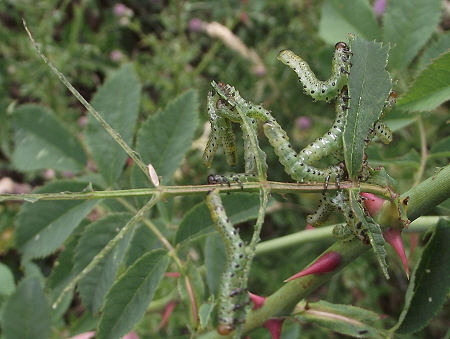 Rose sawfly Arge ochropus larvae devouring the leaflets of wild rose. 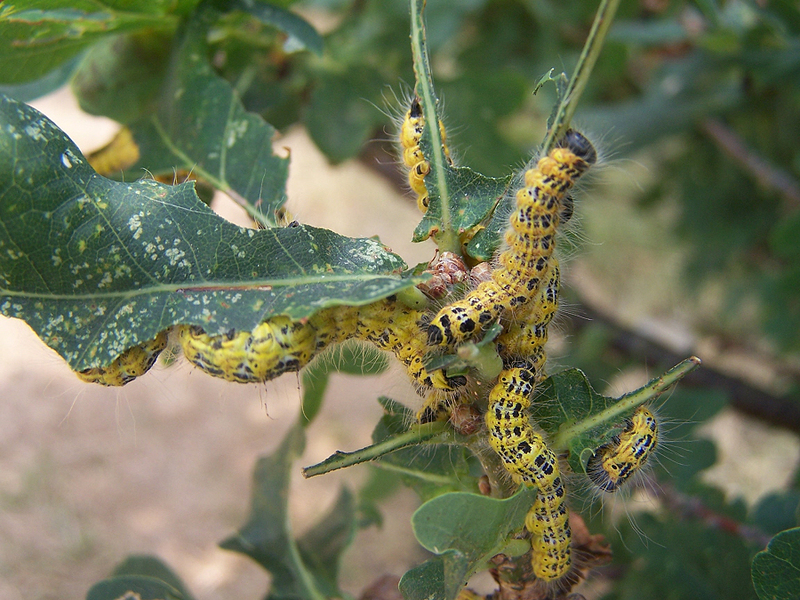 Oak sawfly larva Periclista lineolata a pest of oak trees. 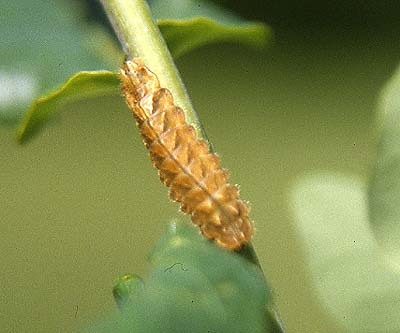 Voracious larvae of Hazel Sawfly Croesus septentrionalis on Hazel leaf. 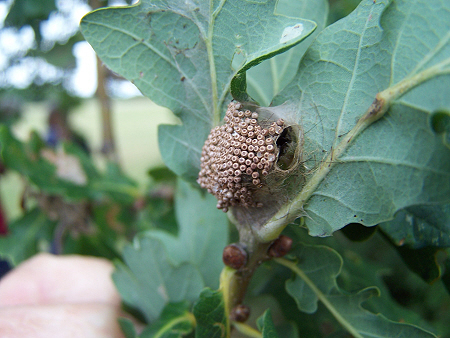 Close up of Hazel sawfly larvae above. 13th September 2012. 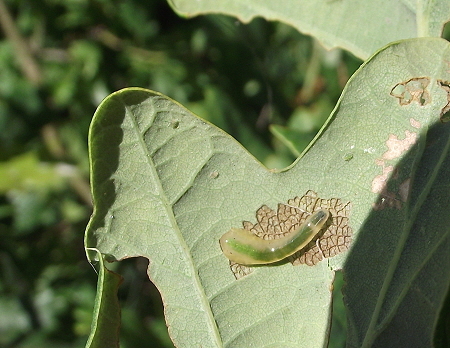 I found this "slug" eating the upper layer of cells on a pear leaf. On further examination I identified it as a Pear slug-worm, It is the larva of a Cherry sawfly Caliroa cerasi. 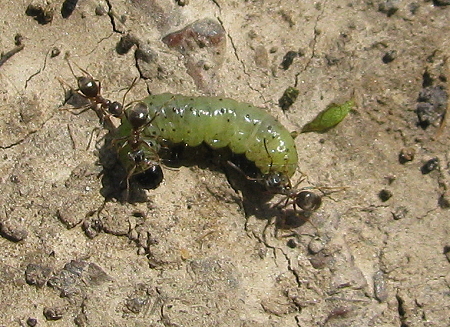 It is neither slug nor worm but an insect larva which is covered in a thick black slime. Fruit trees by the farm. 17th July 2014. 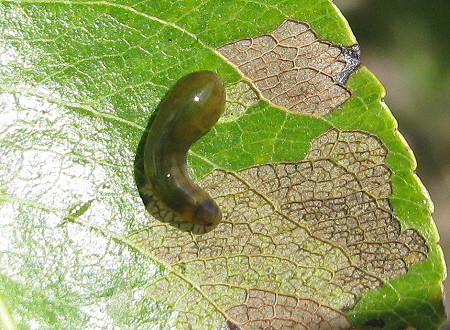 A Slug worm, the larva of a Sawfly Caliroa annulipes on oak leaf. 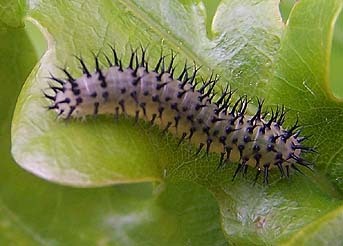 It is feeding on the soft tissues on the underside of the oak leaf leaving skeletonised patches. 10th July 2015.